Safety at work is one of the biggest concerns for any business owner. The lighting of any property can hugely influence personal well-being and health, motivation and performance. In the workplace lighting has to meet occupational health and safety requirements. What has to be taken into consideration when it comes to office lighting is not just the aesthetics of how the lighting is incorporated into the building but the impact it has on the workers and in turn the business. The first and most obvious reason for high quality lighting is how light can eliminate workplace trips and falls. The better lit an area is the safer it is, and if all workers can clearly see any hazards the easier it is for them to avoid them. Any glare or shadowy areas can cause someone to walk right into a dangerous situation or avoidable hazard, which can lead to all manner of serious injuries. As well as the obvious safety issues concerning the lighting systems that you use in your workplace there are other issues such as productivity and health effects, which can include unnecessary fatigue and eyestrain. In any role it is vitally important that each employee can clearly see what they are doing, ranging from an office worker at a desk to a mechanic in a garage. If your lighting solutions are not of a high quality than neither will the work you employees are producing. Another extremely important factor of good lighting is two illnesses called Sick Building Syndrome (SBS) and Seasonal Affective Disorder, both of which can be caused by poor lighting. They can cause people to become extremely lethargic, irritable and generally lack energy, which is very disruptive in the workplace. Both illnesses can and often lead to depression, which can in turn lead to long periods of time where the affected are unable to work. Planning the right choice of workplace lighting depends on what area of business the building is being used for. In most cases the best possible choice of all round high quality lighting is LED light panels. Unrivalled in brightness LED lighting will brighten up the darkest of spaces. Creating a well-lit and refreshing atmosphere is key in any space, from a corridor to a meeting room, and a far cry from low wattage suspension lighting, LED lights will ensure a brightener area and in turn a better workplace. A very modern choice, LED lighting technology is one of the most important advances within the industry since the invention of the light bulb and thanks to energy efficiency and cost effectiveness is becoming a widely popular choice. LED light panels can produce 500-5000 lumens of enhanced light, depending on the size and colour you choose. Therefore LED lighting not only can transform dark corners and badly lit working areas but also it can boost moods and productivity with its unrivalled brightness. For more information on switching to LED products visit LED LightSense. 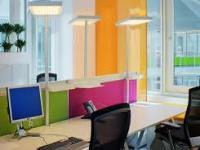 In turn LED lighting will create a safer, more successful and happier working environment.